North-west South America remains comparatively under-developed. Powerful chiefdoms have formed in this region. The north-west region of South America has seen much development during the 18th century. 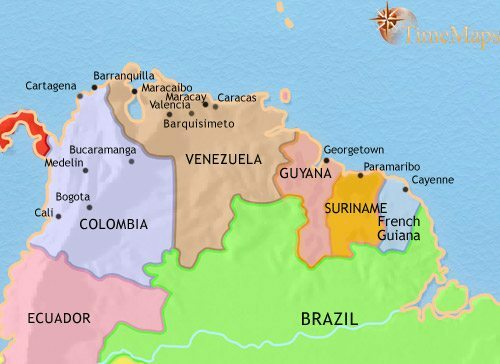 Colombia and Venezuela are now independent countries. Colombia and Venezuela experience violent political instability. Colombia and Venezuela experience unrest and chaos - but also economic expansion. Both Colombia and Venezuela have become democracies. Colombia has been troubled by drugs wars. North-west South America remains a comparatively under-developed part of the Spanish empire. The steep mountain scenery makes transport and communications difficult, and in many places hostile Indians make Spanish rule more theoretical than real. Many settlements in the interior are extremely isolated. Where Spanish rule has been established, large landed estates are to be found, using Indian and mestizo labour. The coastal plains of both the Pacific and Caribbean seaboards are unhealthy and underpopulated, and on the Venezuelan coast, a focus for smugglers and pirates. Catholic missions dot the region. The north-eastern coasts on South America have been almost completely neglected by the Spanish. Here, French and Dutch settlers have gained a foothold. The coastal areas of north-western South America are unhealthy and under-populated, but in the interior, isolated pockets of population have flourished in a land broken by high mountains and deep valleys. Intensive farming provides the economic base for the well-organized Muisca and Wayuu chiefdoms. These house complex societies, and considerable trade routes link the centres of population. Some of the most sophisticated South American material culture outside the Andes region can be found here. 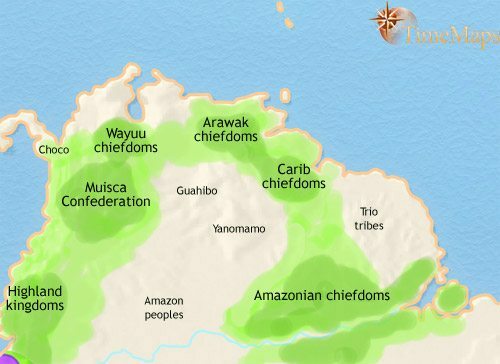 To the east, along the Caribbean coast, Arawak and Carib peoples have been established for centuries, their ancestors coming into the region from the Amazonian interior. Their iron-age farming and distinctive plaza villages form the nucleus of warlike chiefdoms. It is from here that these peoples’ forebears set sail to colonise the islands of the West Indies. 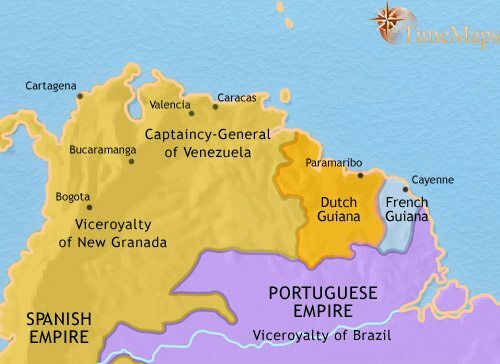 The north-west region of South America has developed considerably during the 18th century, a fact recognised by the Spanish government in the establishment of the viceroyalty of New Granada, with its own regional administration. Better administration has led to an expansion in trade and settlement. The population of the region has increased greatly. On the Venezuelan coast, the port of Caracas has become a thriving commercial centre, its prosperity based on the cacao trade. There are also many plantations, worked by black slaves. Throughout present-day Colombia and Venezuela, the traditionally dominant landowning class has been joined by an elite of wealthy merchants from the coastal cities. These enjoy closer-contacts with European thought and culture than any other group in South America. To the east, the French and Dutch colonies have established a flourishing slave-based plantation economy, on or near the coast. The interior is almost completely undeveloped, the home of the Arawak and Carib Amerindian peoples. With liberation, the old Spanish viceroyalty of New Granada became the independent Federation of Gran Colombia, with the hero of the liberation movement, Simon Bolivar, as its president. Soon, however, regional tensions resulted in the break up of the federation into the separate counties of Colombia, Venezuela and Ecuador (1830). Colombia (named the Republic of New Granada) has become a democracy, with the famous general Santander as president. It has experienced stability and economic progress. Venezuela, on the other hand, is now under a military dictatorship. 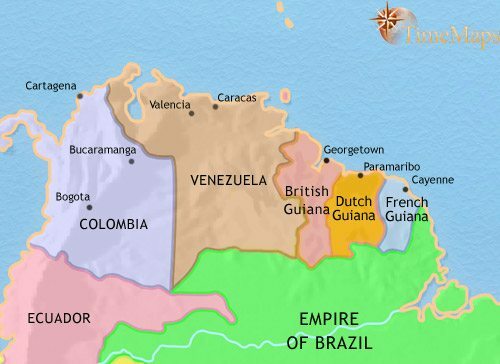 To the east, the British have taken over a large part of Guiana from the Dutch as a result of the Napoleonic Wars (1814). Slavery is abolished throughout the British Empire in 1834, and the ex-slaves are establishing their own communities along the coast. To replace the freed slaves, the colonial power is bringing in workers form their colonies in Eastern Asia, particularly India. Apart from a brief military coup in 1854, Colombia has been governed by civilian democratic governments. Its politics, however, is characterised by bitter, and often violent, rivalry between the Conservatives and Liberals. Venezuela has continued to be ruled by military strongmen (caudillos). The rule of Jose Antonio Paez (1830-48) brought political stability, but then instability set in, leading to a period of violent chaos called the “Federalists Wars” (1858-63). Only the seizure of power by the general Antonio Guzman Blanco has restored order (1870). To the east, the French followed the British in abolishing slavery in 1848. Many of the ex-slaves then migrated inland to form free communities in the interior. A few years later French Guiana began its infamous history as the dumping-ground for France’s worst criminals (from 1854). The Dutch ended slavery in 1863; both the French and the Dutch follow the British example of bringing in workers from their colonies in Eastern Asia to replace the slaves. In Colombia, bitter hostility between Conservatives and Liberals led to the outbreak of a vicious civil war known as the “Thousand Days War” (1899-1902). As many as 100,000 people died in the war, and in its aftermath, Panama, hitherto the northern province of Colombia, seceded with US help (1903). The last few years have seen Colombia’s economy expand, thanks largely due the rise of its coffee-growing industry. In Venezuela, after Guzman’s fall (1888), a period of political turmoil set in again, only ended by a start of a series of ruthless dictatorships in 1899. The rise of the oil industry then began to bring prosperity to the country. To the east, a small gold rush in British Guiana led to some immigration, and a measure of development for the hitherto undeveloped north-west. The inhabitants of the colony were given a small measure of self-government, electing their own officials. In Colombia, a long period of comparative stability and economic expansion came to an abrupt end with the Great Depression of the 1930’s. Tensions between Liberals and Conservatives again spilt over into civil war, and in the late 1940’s and early 50’s a period known as “La Violencia” (The Violence) claimed as many as 300,000 lives. This terrible period was ended by a military coup in 1954, with democracy returning in 1957. Venezuela has experienced dramatic economic growth with the oil boom of the 1940’s and 50’s. After mostly dictatorial rule, in 1958 democracy at last comes to the country, and has endured (more or less) to the present day. 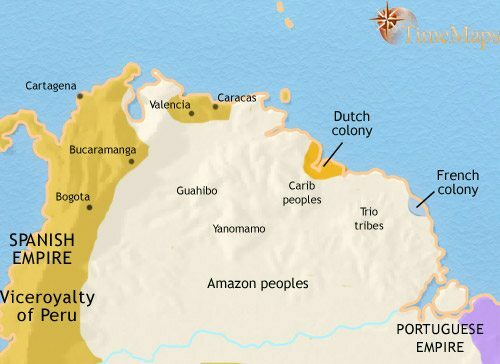 The inhabitants of both British and Dutch Guiana gained more self-government. French Guiana has become an overseas department of France (1946). The terrible prisons of French Guiana have been closed (1954). From the late 1960’s Colombia was plagued by guerilla warfare and then a brutal civil war between the government and drug cartels. While this war continues, Colombia’s deep-seated economic and social problems remain unsolved. A succession of democratically elected governments have aimed to spread Venezuela’s oil wealth throughout society. The huge national debts this incurred caused an economic crisis in the 1980’s, and drugs-related criminal charges against senior politicians led to the rise to power of the populist Hugo Chavez (1998). Chavez has pursued a socialist agenda at home and an anti-US agenda abroad. 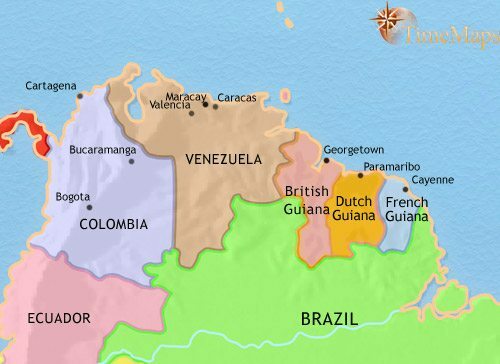 British Guiana achieved independence, as Guyana, in 1966, and Dutch Guiana became independent in 1975, being renamed Suriname. After initial problems, both countries have been governed along democratic lines. French Guiana has been boosted by the establishment of the European Space Agency launch site there in 1975.